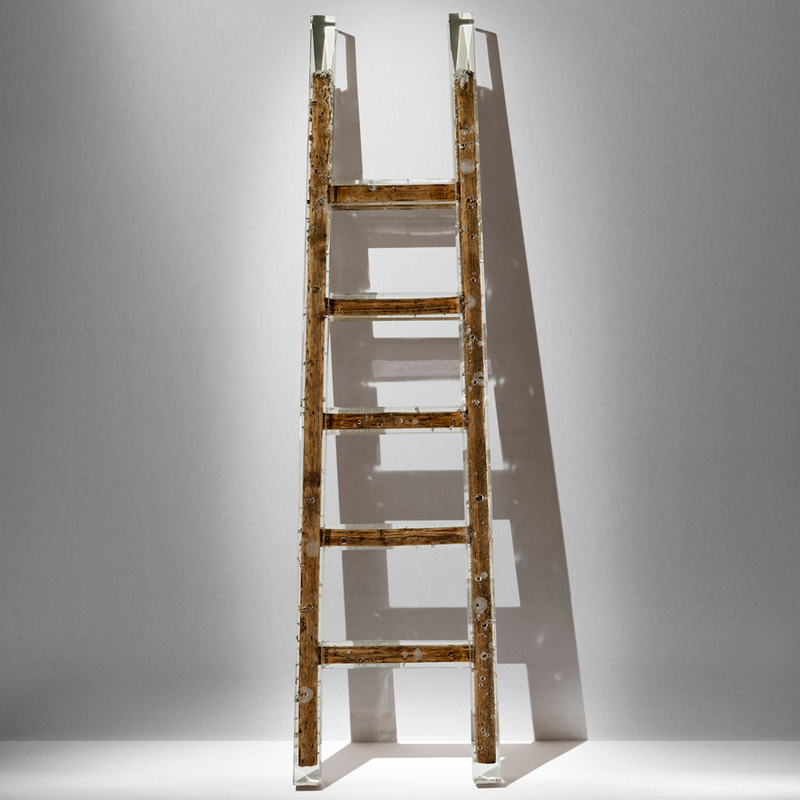 Italian design group Nucleo has cast an antique wooden ladder in clear resin as part of a collection that will be shown at The Salon Art + Design show in New York this week. The ladder suspended in resin is part of a series called Souvenir of the Last Century, which also includes a stool set in the same solid substance. Nucleo is showing the pieces with Cologne-based Ammann Gallery at the art and design fair in the Park Avenue Armory on Manhattan's Upper East Side. Also debuting is a totem-like resin light fixture called Fossil. The group is also showing a new version of its Primitive Table in a frosted white colour with a matte finish. Nucleo's previous pieces for Ammann have used other found objects including stools and old lumber cast in or joined to resin. They have also used coloured acrylics to simulate semiprecious stones for stools and other furniture. "Every piece is a process," Gabrielle Ammann, owner of Ammann Gallery, told Dezeen earlier this year. "They work and experiment until they get the quality that they want." For Milan-based Nilufar Gallery, the group has created a bronze chair called Presence, which features a gridded design. Small squares are subtracted from the gridded seat creating a pixilated effect with holes, while bronze cubes are added to the legs and seat back. The Salon Art + Design is a four year old art, antiques, and design fair held in New York City. Other design galleries showing there this year include Friedman Benda, Carpenters Workshop, Galerie Kreo, and David Gill Galleries. The Salon Art + Design runs through November 16, 2015.